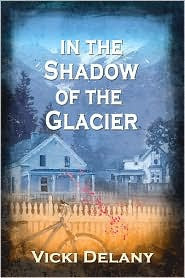 In the Shadow of the Glacier is the book that launched Vicki Delany's Constable Molly Smith series. What a wonderful introduction to Smith, Detective Sergeant John Winters, and, most of all the slightly off-beat town of Trafalgar, British Columbia. There are less than 10,000 people in Trafalgar, a town that welcomed draft dodgers from the United States during Vietnam, and still accepts young people who drift into town. But, the town is up in arms over two possible changes. Reg Montgomery and his business partner are planning the Grizzly Resort, a development some townspeople accept as necessary for jobs and tourism, while others view it as a desecration of the land. The other change is the proposed Commemorative Peace Garden, dedicated to Vietnam War protesters. Molly Smith's mother, and other sixties rebels, are up in arms, supporting the garden, and opposed to the resort. When Constable Molly Smith finds Montgomery's body in an alley, she's asked to provide local background for Winters, a new addition to Trafalgar's police department, although he was in homicide in Toronto. Molly's thrilled to work on her first homicide case. She's not as thrilled to see her parents as torn apart by the town's troubles as the town itself. Delany creates a vivid setting in Trafalgar. And, she skillfully combines a police procedural with a traditional mystery, set in a small town. Her police officers don't have the luxury of working just one case. They have their hands full with a murder investigation, stolen bikes, an American journalist who stirs up the town, and protests. And, Molly, a rookie, has to learn to cope with her job, and her personal life, as she watches her parents fight, and her best friend cope with a stalker. In the Shadow of the Glacier is an outstanding introduction to a promising mystery series. In the Shadow of the Glacier by Vicki Delany. Poisoned Pen Press, ©2007. ISBN 9781590584484 (hardcover), 302p. Sounds like another good series that I will have to investigate. I surmise by the length of the post that your hand is out of the splint and feeling better. I am so glad! I really like this series. i would recommend it. Well, Molly, the hand is out of the splint, and still a little swollen. But, I'm using it, and using the stress ball to try to strenghen it. We'll see. Check this one out, Joy. I really enjoy this new series. Isn't this series a treat? I love it. You are back to writing reviews. I hope that means you are getting better. Thanks, Kay. The splint is off. The hand is still wrapped, and I have a staff member who watches it carefully. I'm not going to overdue it, and if Julie says go see the doctor, I'll leave immediately. She worked in a doctor's office, and was in charge of wraps and casts. I trust her 100%. The doctor said I could use it, and he said I need to get the mobility back. So, I'll be careful, Joe. I read the second book in the series before reading this one. I wish I'd read them in order. Very good books! Thanks so much! I'm glad you liked the books. Look out for Winter of Secrets from Poisoned Pen in November. I'll be waiting, Vicki! Thank you.